Whipped with milk or cream, butter, brown sugar and sweet spices. Then I said, “Use coconut milk if you want them to be vegan.” That, was a moment of GENIUS! And that’s how I made them for Thanksgiving and they were FANTABULOUS! I made enough for two Thanksgiving dinners so adjust this recipe to suit your needs, bearing in mind that they freeze beautifully. I slow roasted the potatoes in the skins to retain all their flavor and raise their sugar levels. 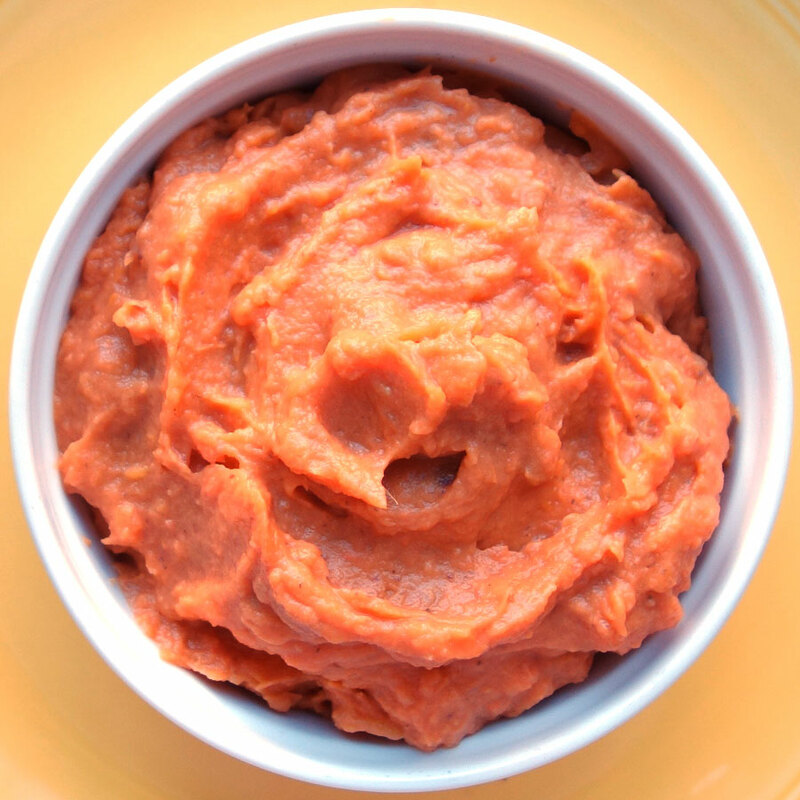 This simple dish of coconut whipped sweet potatoes is vegan, but you would never know because it’s delicious. Perfect as a side dish for Thanksgiving or any fall-winter meal. Coconut sugar (or brown sugar) for sprinkling. Place sweet potatoes on a lightly greased sheet pan. Poke each one, twice, with a fork, just on top. Slow roast the potatoes until they are completely soft. Remove the sweet potatoes from the oven and cool. Peel skins and discard them.Mash potatoes with a masher, a food processor or whip them, like I did, with a stand mixer fitted with the wire whip. Add the coconut milk a little at a time to incorporate it. Add sugar a little at a time, being careful not to over sweeten them because the sweet potatoes could be very sweet from their slow roasting. Season to taste with salt and pepper. Place coconut whipped sweet potatoes in a baking dish to reheat in a 350 F° oven before serving. You may find that a sweet potato caramel forms on the sheet pan when you’re roasting. I suggest scraping it off the pan and adding it to the warmed coconut milk and dissolve it. You can add cinnamon, allspice, fresh ginger juice, etc. to give them more flavor dimension, but I just left them plain. Singing Chef Jackie Gordon makes, muses and munches on food, music and more in the Big Apple and beyond. Copyright © 1995–2019 Divalicious Inc.